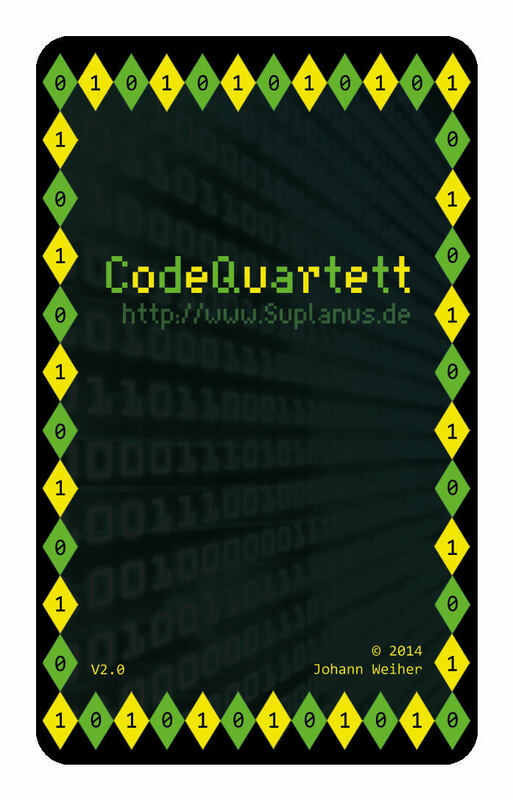 The CodeQuartett is the game which detroys the never ending war "which programming-language is the best?". This was the base of the idea of this game. The cards are perfectly for programmer-noobs or for technical interested people, who want to know the difference between all the languages. 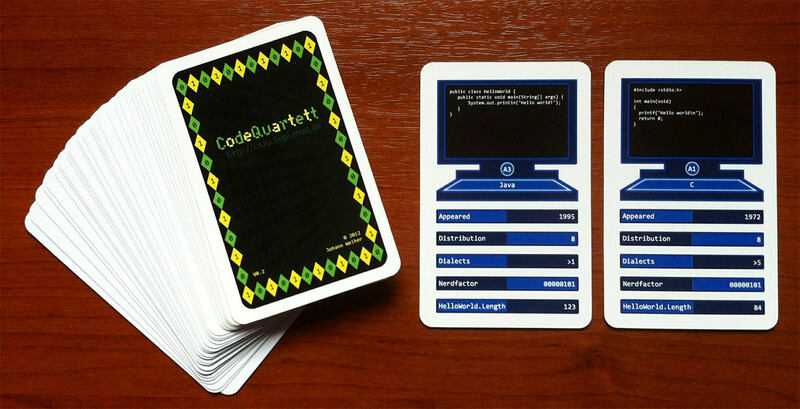 You are allowed to print the cards or change the design, or make your own version of CodeQuartett. All the graphics and Texts are under Creative Commons BY-NC 3.0 license. You can find the files on GitHub in differenz formats, the hello-world examples as well. The year when the language was released, older is better. 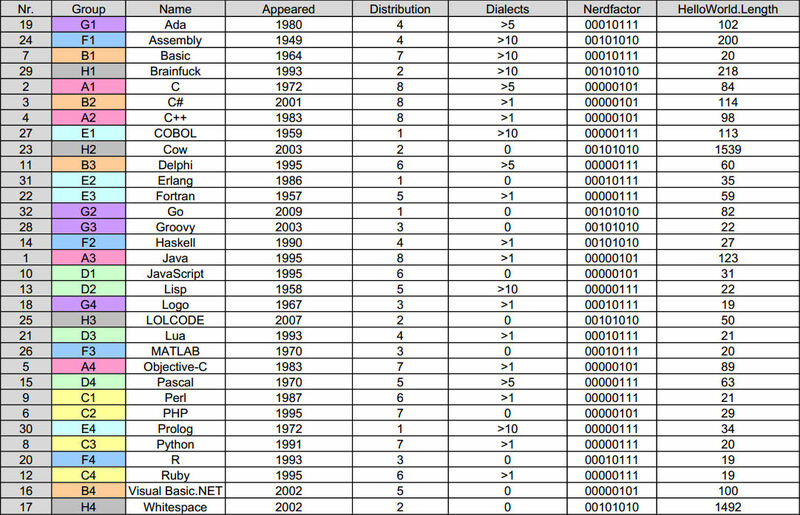 This property was measured on the basis of the Tiobe Index. 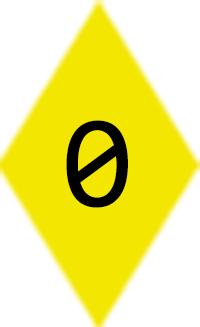 Rounded to values of 1 to 8. The higher one wins. The character count of the hello-world example. Source was Wikipedia. All the cards are dealt among the players. 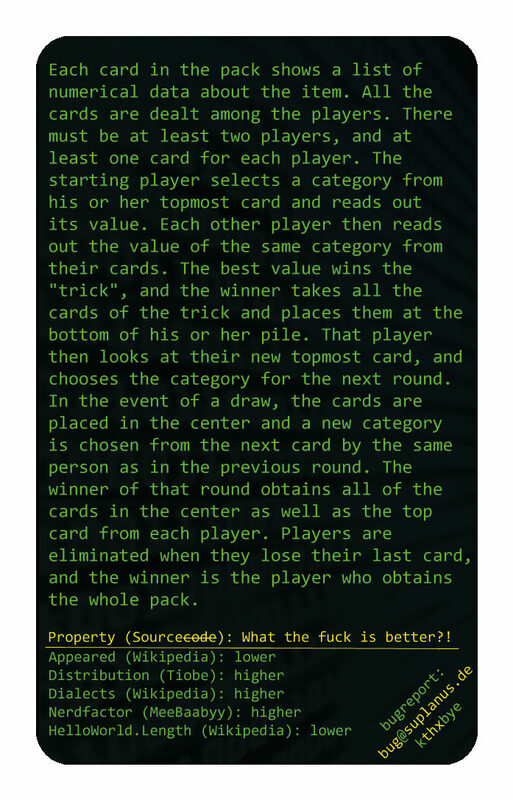 There must be at least two players, and at least one card for each player. The starting player (normally the player sitting on the dealer's left) selects a category from his or her topmost card and reads out its value. Each other player then reads out the value of the same category from their cards. 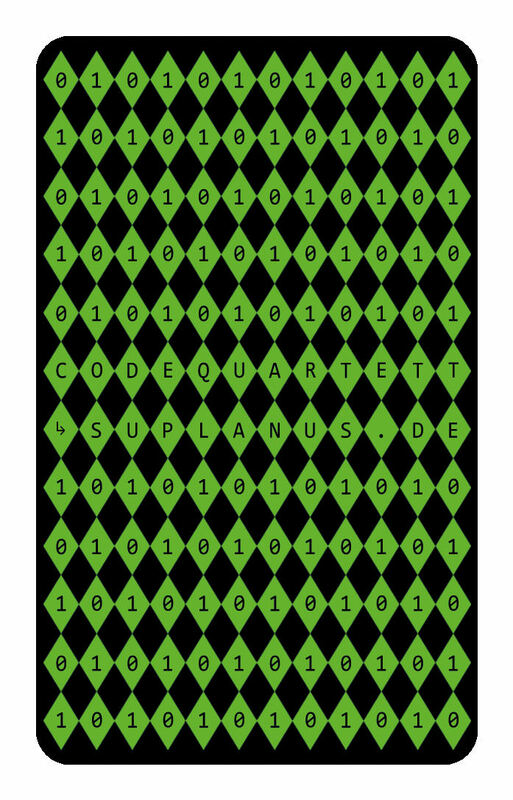 The best value wins the "trick", and the winner takes all the cards of the trick and places them at the bottom of his or her pile. That player then looks at their new topmost card, and chooses the category for the next round. The idea was on a little hackerthon of some friends. We discussed which languages are better than other ones. 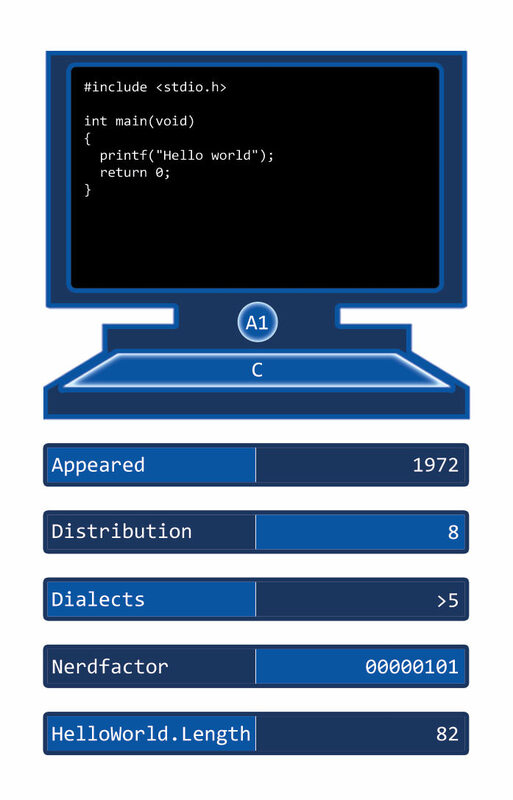 I am no designer, only a programmer, but the cards are fully designed in one night. The properties also collected in one night. Searching a print office was not so easy. But i found one, printed a (expensive) test-game and i was happy. I only want to print 500 games for the first run, because i don't know how much i can sell. But then the deck was lounge around, and after a half year, i decided to start a crowdfunding project. 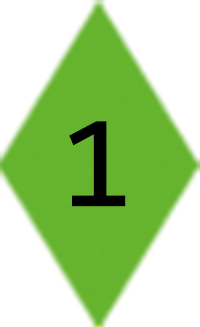 The project was started and twitter helps to found the project fast. BBC-Radio interviewed me, because they liked the idea! I gave the order to the print office... but it was to insufficient. Begin of 2014 i reordered V2.0 of CodeQuartett.